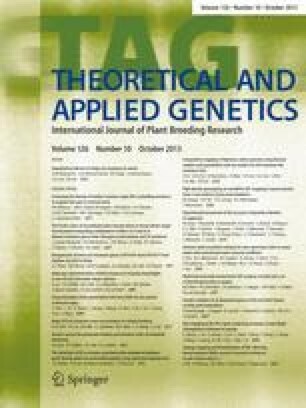 Angular leaf spot (ALS) causes major yield losses in the common bean (Phaseolus vulgaris L.), an important protein source in the human diet. This study describes the saturation around a major quantitative trait locus (QTL) region, ALS10.1, controlling resistance to ALS located on linkage group Pv10 and explores the genomic context of this region using available data from the P. vulgaris genome sequence. DArT-derived markers (STS-DArT) selected by bulk segregant analysis and SCAR and SSR markers were used to increase the resolution of the QTL, reducing the confidence interval of ALS10.1 from 13.4 to 3.0 cM. The position of the SSR ATA220 coincided with the maximum LOD score of the QTL. Moreover, a new QTL (ALS10.2UC) was identified at the end of the same linkage group. Sequence analysis using the P. vulgaris genome located ten SSRs and seven STS-DArT on chromosome 10 (Pv10). Coincident linkage and genome positions of five markers enabled the definition of a core region for ALS10.1 spanning 5.3 Mb. These markers are linked to putative genes related to disease resistance such as glycosyl transferase, ankyrin repeat-containing, phospholipase, and squamosa-promoter binding protein. Synteny analysis between ALS10.1 markers and the genome of soybean suggested a dynamic evolution of this locus in the common bean. The present study resulted in the identification of new candidate genes and markers closely linked to a major ALS disease resistance QTL, which can be used in marker-assisted selection, fine mapping and positional QTL cloning. The online version of this article (doi: 10.1007/s00122-013-2146-1) contains supplementary material, which is available to authorized users. The authors thank Dr. Phil McClean for allowing the usage of the bean genome sequence assembly data from Phytozome. PRO received a fellowship from São Paulo Research Foundation-FAPESP (2009/02411-2). This work was supported by São Paulo Research Foundation-FAPESP (2010/51673-7).